The Loom Design Studio, made by Expressions, has a very unique look. It has 30 pegs, and is collapsible, being touted as a travel loom. It has scissor style connections with 5 pegs on each arm of the scissor. There are 4 hinge points along the center, and six hinge points along both outside edges. There is a lock on the ends of the loom to keep the loom from collapsing once it is expanded. 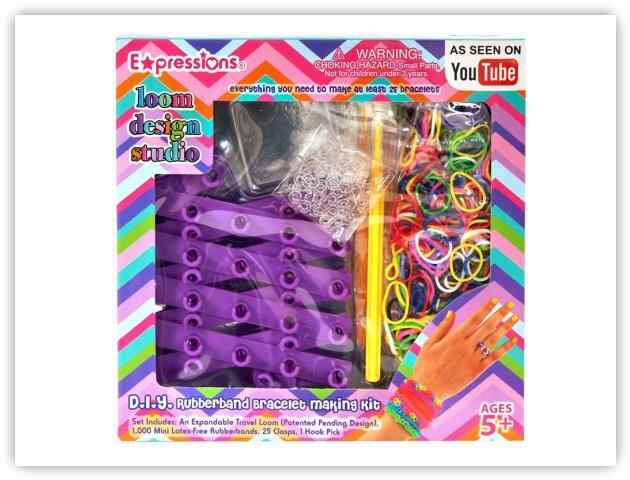 The Loom Design Studio kit comes with the loom, 1000 elastic bands, 25 "S"-Clips, and a hook pick.